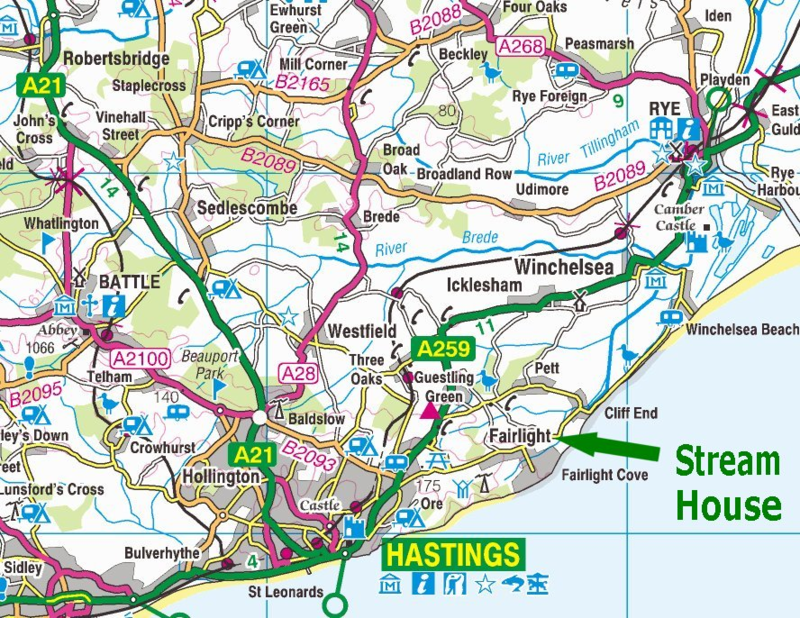 Directions to Stream House Bed and Breakfast Rye from London (A21) AND from Ashford (M20, Kent). From the M25 at J5, take the A21 south, past Tunbridge Wells, towards Hastings in East Sussex. Several miles after the Battle roundabout, you will see Claremont School on your left and soon after, a bridge over the road. Turn right immediately under the bridge, then right again bringing you over the same bridge – signposted Folkestone (A259). Continue on this road (The Ridge) for nearly 10 minutes to traffic lights – turn right into a shopping area, then almost immediately sharp left onto Fairlight Road (by the Co-op). Continue on Fairlight Road for just over 5 minutes. After descending a steep hill you enter Fairlight village. Continue on the road until it again descends steeply. Then turn left into Stream House Bed and Breakfast immediately after the ‘Road Narrows’ sign (opposite Leather Waggon). Leave the M20 at junction 10 and follow signs for A2070 (Brenzett). Continue on A2070 to Brenzett roundabout. Continue straight on, joining the A259 (Rye). As you enter Rye, turn left at the mini roundabout, signposted A259 (Winchelsea). After leaving Rye and driving into the countryside, take the next left to Winchelsea Beach. Stay on this road through Winchelsea Beach and Pett Level. After passing a right turning to Pett, drive on into countryside for about a mile towards Fairlight. Then, just after a sharp right bend, turn right into Stream House Bed and Breakfast immediately after the ‘Road Narrows’ sign (opposite Leather Waggon). Note: if driving from Dover, follow signs for A20 (London). A20 leads on to the M20. Leave the M20 at junction 10 and follow directions as above.